Living in San Mateo County affords families a multitude of opportunities to participate in cultural, recreational and social activities among its many active, thriving communities. Home to towns like Menlo Park, Atherton, San Mateo, and Belmont, San Mateo County is convenient to top employment opportunities, contains stellar public and private schools, and is accessible to many parks, hiking trails, and beaches, making the county an ideal place to live and raise a family. Whether you live in a quiet suburban town like Emerald Hills, Redwood City or Hillsborough, or in a thriving urban area such as San Carlos, Belmont or Burlingame, you’ll want to make time to take advantage of all the opportunities San Mateo County has to offer you and your family. When your days are full and you wish you had more time to enjoy San Mateo County, Aunt Ann’s In-House Staffing can help you create a fulfilling, balanced lifestyle by providing you with top-notch domestic and childcare personnel. Aunt Ann’s In-House Staffing has over 60 years of experience favorably matching the personalities and staffing needs of San Mateo County households with the characteristics and employment backgrounds of professional, highly skilled nannies, housekeepers, estate managers, private chefs, personal assistants and more. As a third-generation, family-owned business, we’ve earned the trust and loyalty of both employers and domestic professionals. That’s why we are called upon repeatedly by established San Mateo County clients as their needs for domestic help expand. We know it’s essential to find reliable, trustworthy staff to care for your home and family. When it comes to finding a nanny for your children, Aunt Ann’s ensures that only the most caring, dependable and skilled candidates are presented to you for consideration. We’ve successfully matched nannies with many families in towns like Menlo Park and Atherton, and our clients consistently recommend us to their friends. From Redwood City to Burlingame, our experienced, diligent and discreet housekeepers, estate managers, personal assistants, and private chefs are happily working in homes throughout San Mateo County. The Aunt Ann’s team places extraordinary domestic professionals in great jobs offered by great San Mateo County families. One reason for our success in making favorable placements is that we establish the highest standards for hiring practices in the industry. Our thorough screening process protects our clients from Hillsborough to Menlo Park, as well as our nannies, housekeepers, and other staffing candidates. In the late 1980s, we were the first in-house staffing agency to include independent background checks as a standard for the industry in screening candidates for placement in private homes and the first agency in San Mateo County that required work authorization for agency representation. We accept job orders only from clients who abide by wage and labor laws and who provide respect partnerships with resources for wage and labor. We partner with esteemed industry experts, and we share those resources with our clients and domestic staffing candidates to ensure they have access to wage, labor and payroll experts. When you use Aunt Ann’s In-House Staffing, you know your domestic employment arrangement is legitimate and mutually respectful. At Aunt Ann’s In-House Staffing, our objective is to connect San Mateo County families and domestic professionals who are thoroughly suited to each other. Unlike online services, we meet with our candidates in person, and our employers have the opportunity to learn about candidates’ character traits, working styles, and employment preferences. While our application and reference-checking procedures allow us to match skill sets to job duties, it’s our team members’ exceptional listening skills that enable us to find the perfect fit between our clients in the San Carlos, Redwood City, and Emerald Hills areas and the nannies, personal assistants, and housekeepers they seek. We never insist that a candidate accept a job that is the wrong fit, believing that it’s our responsibility to help candidates find their dream jobs and families to find their dream employees. We love bringing together perfectly matched San Mateo County families and domestic professionals! Reliable, Exceptional Service: Aunt Ann’s 60-year track record of in-home domestic staffing has fostered trusting relationships between our team members and three generations of our Belmont, Atherton, and San Mateo clients’ family members. A testament to our reliable, consistent customer service is that we frequently receive phone calls from individuals whose childhood nannies were placed by Aunt Ann’s and who are now looking for a nanny for their own children, or from families who adored the housekeeper we matched with them and are currently seeking a personal chef or estate manager. Our San Mateo County clients come back to us knowing they can trust us to be discreet and consistent in matching them with compatible in-home staffing time and again. Each of Aunt Ann’s domestic and childcare professionals have between 2 and 40 years of experience, and many of them have received formal training in their area of expertise. We conduct in-person interviews and comprehensive screenings of all of our domestic staff candidates, making us your source for trustworthy, competent nannies, housekeepers, estate managers and any other domestic professionals who will interact with your family in your San Mateo County home. 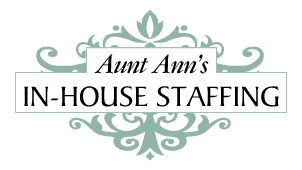 Unique Fee Structure: At Aunt Ann’s In-House Staffing, we don’t charge you any fees until we’ve successfully placed a domestic professional in your San Mateo County home. We offer an up-to-five-day work trial period to our Menlo Park, Hillsborough, Burlingame, Redwood City, San Carlo, and surrounding area clients and job candidates before charging our clients a placement fee, and a one-year fee credit applicable to your next hire if there is an unexpected termination of services after the trial period ends. And, unlike other staffing companies, we never charge a registration fee to start the search process—a savings for you of between $150 and $500! Also, our placement fees for domestic help and nannies are much lower than those of other staffing companies and include more services, such as a legal job offer and employment contract prepared by an employment and labor law attorney. We’d Love to Discuss Your Staffing Needs! To learn more about our San Mateo County household and nanny staffing services, give us call at 415-749-3650 or email us and put our 60 years of staffing success to work for your family. Aunt Ann’s In-House Staffing has continually been recognized as an industry leader in setting hiring standards on both a local and national level. Our clients have consistently given us five-star ratings for our outstanding skill in matching them with household staff, such as nannies, housekeepers and personal assistants, who are perfectly suited to their needs. Click here to learn more about Aunt Ann’s involvement in the San Mateo County community.